The Kintetsu Osaka Line is a private railway that runs through three prefectures: Osaka, Nara, and Mie. The line runs from Osaka Uehommachi Station in the Tennoji Ward of Osaka to Ise-Nakagawa Station in Matsusaka City, Mie Prefecture. There is also a Limited Express through service that runs on this line and the Kintetsu Nagoya Line all the way to Kintetsu Nagoya Station. In this article we will look at the key destinations on the Kintetsu Osaka Line, and then at the Limited Express service for Nagoya. Kintetsu Railways are not covered by the Japan Rail Pass but there are other discount passes which we will examine at the end of this article. There are 44 stations on The Kintetsu Osaka Line. 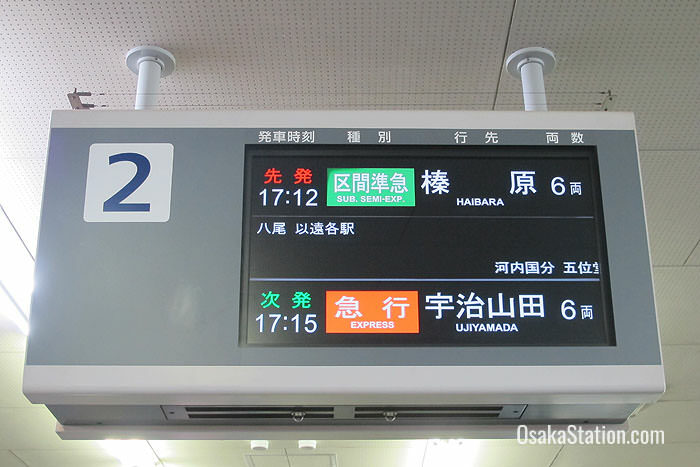 The key destinations and transfer points are given below with fares and travel times from Osaka Uehommachi Station. This station is convenient for the Shinkabukiza Theater, the Sheraton Miyako Hotel Osaka and the information exchange center at Osaka International House. Osaka Uehommachi can be accessed via the Kintetsu Namba Line from Osaka Namba Station. Transfers can also be made here to trains bound for the Kintetsu Nara Line. At nearby Tanimachi Kyuchome Station transfers can be made to the Tanimachi Subway Line and the Sennichimae Subway Line. Exit here for Miyuki-dori Shopping Street (also known as Korea Town) and the famous Korean “yakiniku” or grilled meat restaurant Ajiyoshi. There are three closely connected stations here which are run by Kintetsu, JR West, and Osaka Municipal Subway. 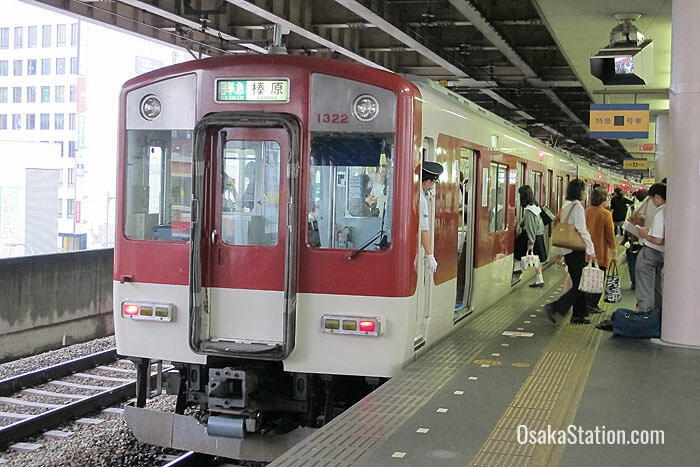 Transfers can be made to the JR Osaka Loop Line, the Sennichimae Subway Line, and to trains bound for the Kintetsu Nara Line. Transfer here to the Osaka Higashi Line. Exit here for Kindai University. Transfer here to the Kintetsu Shigi Line. This station is located in the city of Kashihara, in Nara Prefecture. Here you can transfer to the Kintetsu Kashihara Line with trains bound for Yamato-Saidaiji, Kashiharajingu-mae, and some through trains bound for Kyoto. At Yamato-Saidaiji you can transfer to trains bound for the historic city of Nara. At Kashiharajingu-mae you can transfer to trains bound for the scenic mountain village of Yoshino. Transfer here to the JR Sakurai Line with trains bound for Tenri and Nara. This station is located in the city of Iga, in Mie Prefecture. Transfer here to the Iga Line. Take the Iga Line to Uenoshi Station to visit Iga Castle, and the Iga Ninja Museum. Ise-Nakagawa Station is the western terminus of the Kintetsu Osaka Line in Mie Prefecture. Transfer here to the Kintetsu Nagoya Line with trains bound for the city of Nagoya, or to the Kintetsu Yamada Line with trains bound for Ujiyamada Station in the city of Ise. Ujiyamada Station is the closest station to Ise Jingu Grand Shrine, Japan’s most sacred site. Kintetsu runs 31 Limited Express services from Osaka to Nagoya, and 32 services from Nagoya to Osaka each day. 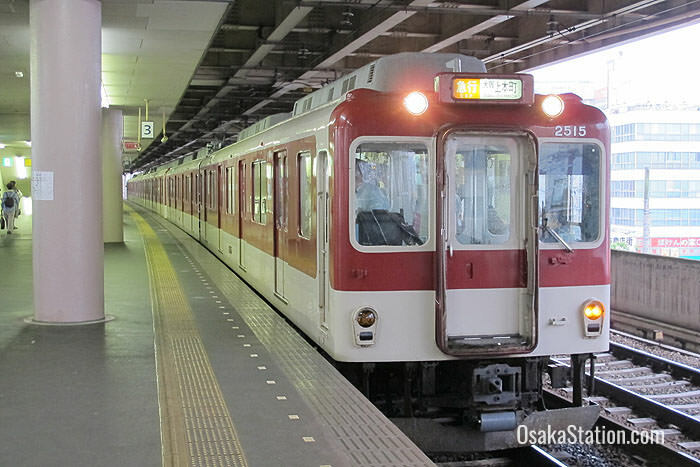 The trains run from Osaka Namba Station on the Kintetsu Namba Line, and then follow the Kintetsu Osaka Line and Kintetsu Nagoya Line to Kintetsu Nagoya Station. Limited stops are made at the following stations (not all trains stop at the stations in brackets). Train times vary, but the average time between Osaka Namba Station and Kintetsu Nagoya Station is 2 hours and 20 minutes. The fare from Osaka Namba Station to Kintetsu Nagoya Station is 4,260 yen (which includes a Limited Express surcharge). If you wish to use this service, use English language route finders like Hyperdia or Jorudan to find the best trains times for your journey. Kintestu Railways are not covered by the Japan Rail Pass, but there are number of other discount options which can be used to visit Osaka, Nara, Kyoto, Nagoya and Ise-Shima. Of these the Kintetsu Rail Pass and the Kintetsu Rail Pass Wide are the most useful.